This weekend I sewed up my first pair of ponte pants (V8962). They were cut shortly after my last post and I was trying to clear it from my to-sew pile sine my knitwear class has progressed to the point of pull on pants (hello, ponte pants #2) and I was looking forward to having a commercial pattern tested and fit to compare to my own pant draft. I was thinking about how easy wardrobe staples can be a little liberating because the idea of filling holes in ones wardrobe with a tried-n-true pattern makes allows for tweaks and improvements with each attempt. As long as this first one went well (fit wise) I was ready and willing to tackle more of the pull on pants from my list. Some notes for posterity on V8962. I've now made all 3 items in this pattern and can say that I am quite pleased overall by the style, level of difficulty and fit. I made all three pieces in a size 20, although my measurements are that of a 22 and all three items feel a smidge big, especially the shirt. So, I think as far as knits go, I'm should be cutting 2 sizes smaller than my measurements dictate on the envelope. The pants are now finished (wearing them now) and went together very quickly/easily. I lock-stitched each seam before serging it finished in this order: inseams, crotch, out-seams. This meant I could test the fit and make any adjustment at the out-seam. One thing I have learned in school and at the company I work for is that most knitwear seams that are not simply serged actually sewn with a lock-stitch, not a stretch stitch. 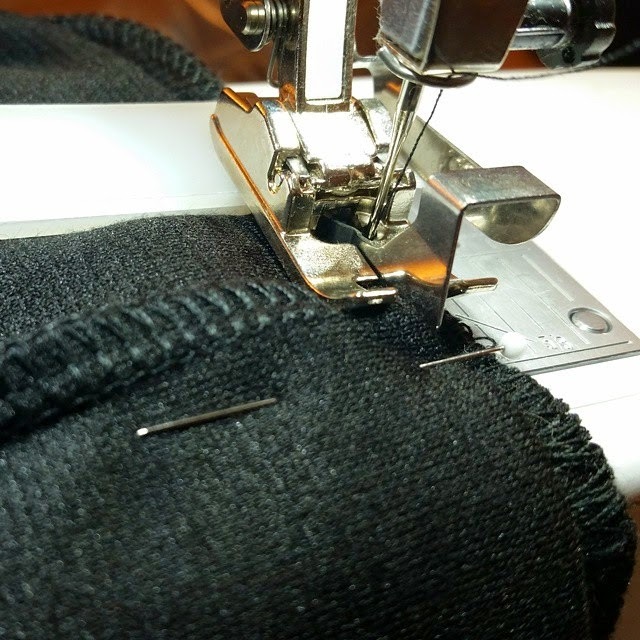 In production all the seams are merrowed (over-locked/serged) only, but when making samples or one-offs a straight lock-stitch is fine (with a ballpoint/jersey/stretch needle). I used one of the stretch overlock stitches on my Bernina to attached the elastic and then stitched in the ditch at the center and side seams. I've been debating about weather or not to enclose the elastic entirely but I kind of like the clean, plain look of these pants even if it does look terribly unfinished. I blind stitched the hem, which was tricky over the serged side seams, but I managed with a leveler at the back of the foot. The fit is pretty good... I cut a size smaller than the envelope recommends for my measurements and I could almost go down another size (I did use the elastic guide for the next smaller size). The silhouette is spot on compared to the envelope sketch; a slim, but not tight boot cut pant with no details. Next time I would add 1" to the top of the rise at the center back waist... it feels lower than the front. There isn't much pitch to the waist, but I like the height of the front rise which is at my belly button, however the back dips down when I sit. I don't have much of a rear end to speak of so I think these are drafted for a very flat dress form. 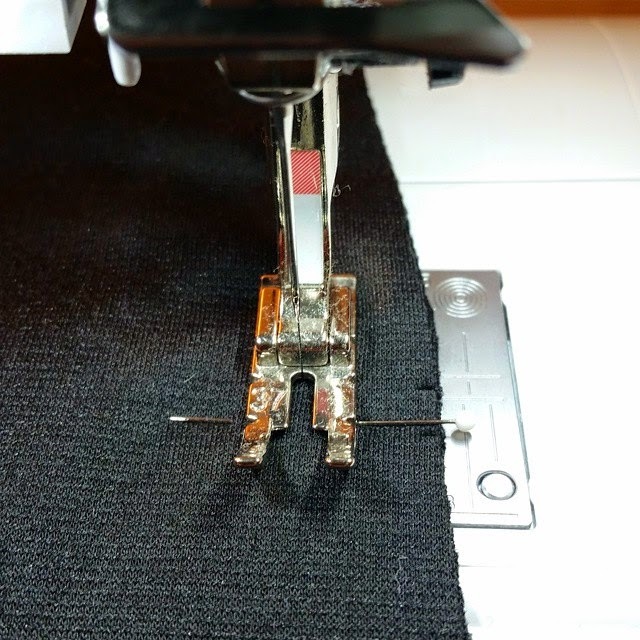 I added 2" at the leg length adjustment line and 1" at the hem and my hem is 1". I would add another inch if next time to hem for wearing with heels. The current hem is a too long to wear with flats but feels a little short over my booties. I obviously need to determine the optimim inseam for flats vs heels. So, I have some modest fall sewing plans, which will in all likelihood change by the time winter hits, but I thought I should post the plans here, and then see how well I'm able to make good on those plans. Whether or not I post the results in picture form is anyone's guess. I seem to be doing better with instagram these days. I am not tracking school projects because the weekly deadlines keep me pretty accountable. Bra - I impulse bought the craftsy class Sewing Braws; Construction & Fit with Beverly Johnson on Saturday. 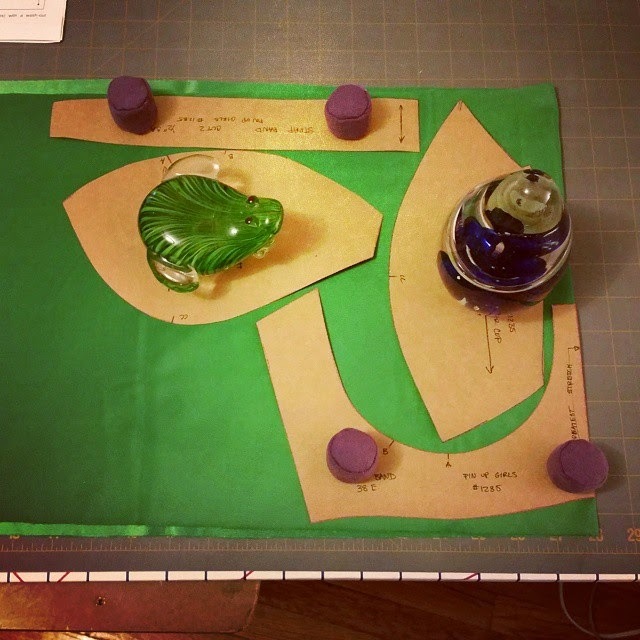 I've had a pattern traced out and a fabric kit for who knows how long. I listened to the class while I finished up my ponte pants and then cut out the pieces needed. I am a bit horrified by the color of this fabric. At least I won't feel to precious about it while sewing. I do need to get some green thread though. I bought a cream colored findings kit and it came with some ivory lace but I don't think they look good together. I may try to find some black replacement findings, elastics and galoon lace. Kelly Green. What was I thinking? Topstitch the side and shoulder seams. Hem. Neckline facing or binding. This is the last of my summer projects and although it is a transitional piece it's teetering in UFO territory. It' sooo close to being done. Need more discipline! Piece the back and ship to longarmer for quilting. Trim the sandwich. Make and apply the binding by hand. Ponte Knit Tube skirt(s) – emerald ponte. Need more skirts. Floral Silk Crepe de Chine pants - Need some luxury fashion in my closet. Tiny Pocket Tank (blue silk w/ black hearts) – double dart modified size 18. Lengthen back shirt-tail. Cotton burn out nightie - kwik sew. Because I love the pattern and my last one is in regular rotation - husband likes it too.